With a classic 50s-inspired true slash neckline, a long-line body for extra comfort and three different sleeve options, The Gable Top will become your new favourite go-to knit top pattern. Gable is perfect for wearing all year round – layered with dresses and cardigans on chilly mornings or worn on its own with 3/4 skinny jeans or a high waisted skirt à la Audrey in spring. Gable is a stylish weekend basic that can be easily dressed up and added to your office outfit rotation. 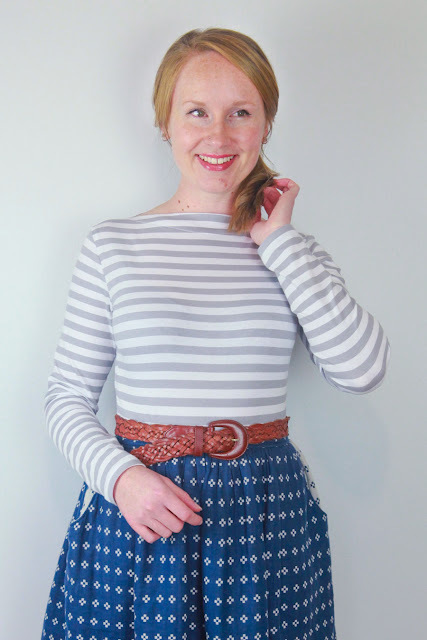 Made with comfy stretch knits, Gable is a quick and easy sew that doesn't use much fabric and turns out perfectly every time. A modern take on a timeless and elegant basic. The idea for Gable has been floating around in my head for a long time. I love knit tops and since releasing Bronte all that time ago, I knew I needed to revisit the world of knits again. They're so easy, so quick and so satisfying to make and wear. Gable is a true slash-neckline top, which basically means it sits at a 90-degree angle straight across the neckline from the inner shoulders. 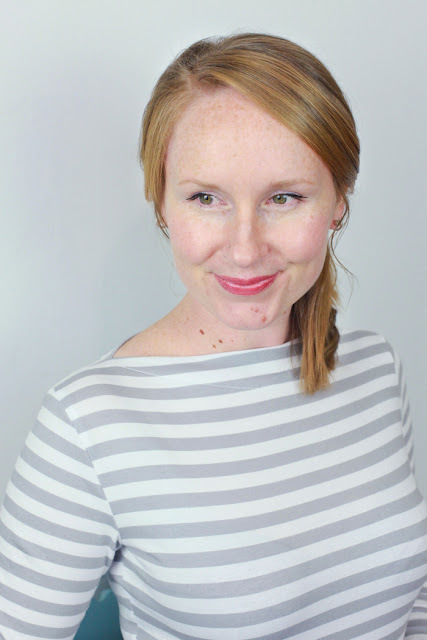 If you love the style, but aren't a fan of necklines sitting up so high, don't worry, I talk about how to alter the height of the neckline in the pattern instructions and will be doing a little tutorial for you as well. Speaking of tutorials, I'll be popping a few up on the ol' blog over the coming weeks – want an even more retro-style Gable? 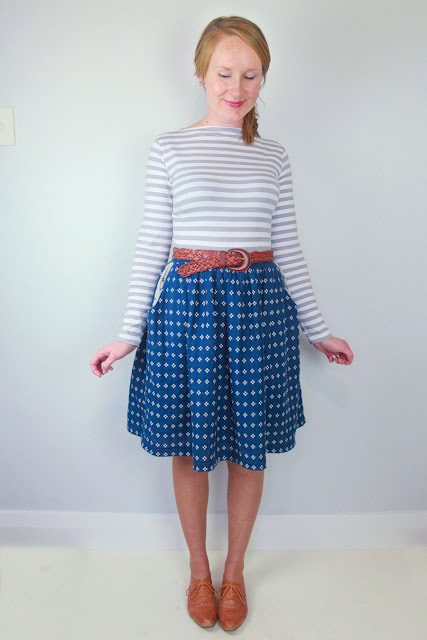 I'll show you how to alter the pattern for 3/4 sleeves (it's a super easy adjustment!). 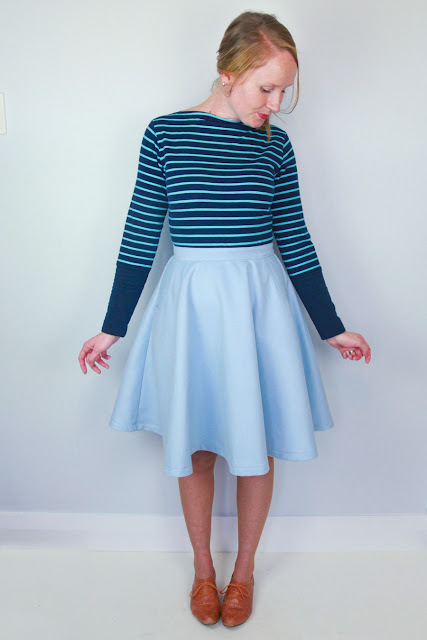 Not sure about sewing with knits? I have lots of in-depth posts already about knit fabrics and sewing them on your sewing machine (as I did with all of my Gable tops!) but I'll be writing a bit more about the process so that you can feel relaxed knowing that you'll come out with a beautiful garment at the end. Gable is really quick to make, for both newbies and advanced seamstresses alike. Plus, she's elegant as heck you guys! You can't put one on and not feel a little like you tried to look nice that day (even though you really didn't because there are crumbs all over the floor, you have greasy hair and it's freezing outside so it's a pj bottom and slippers kinda day). I have a black one that I wear all the time; in fact, I went out on Saturday night for the first time since before Oscar was born (for a crazy wild night of dessert with a lovely bunch of ladies) and it was a perfect choice with a wool Felicity skirt and the freezing temperatures of the weekend (we've had snow! And more is forecast for the end of the week). If you have any questions or anything specific you'd like covered in a tutorial, do let me know. Otherwise, I can't wait to see your Gable tops! 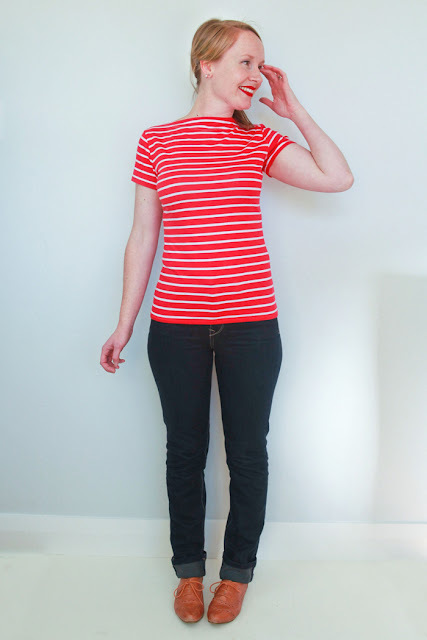 7 comments on "Introducing The Gable Top - A Knit Top Sewing Pattern"
This is such a gorgeous pattern! And what a classic silouhette, and yet something I haven't seen on the indie pattern market. Looking forward to sewing one (or a bunch!) up! It's lovely -- I may have to try this instead of my usual tee shirt pattern ! This pattern is really fabulous! I'll be looking up some appropriate fabric, then coming back to purchase ASAP!